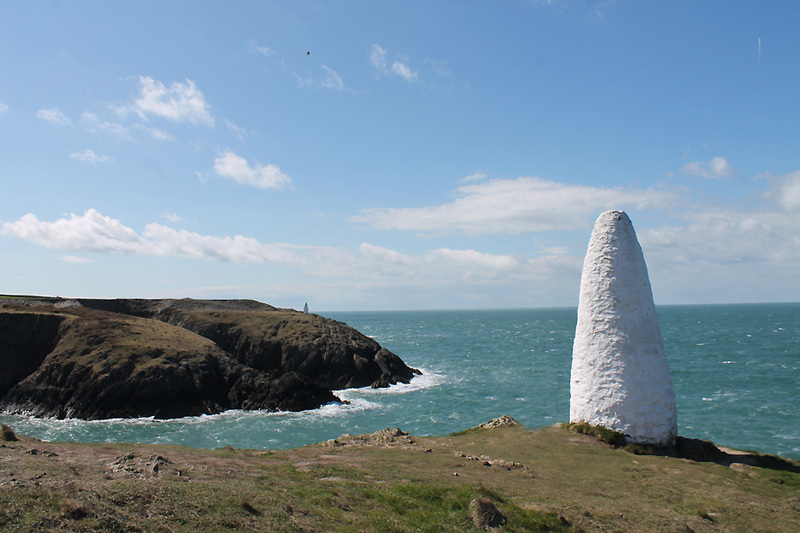 " West Wales - 2 - Porthgain Walk "
Date & start time: 25th April 2016, an afternoon walk. 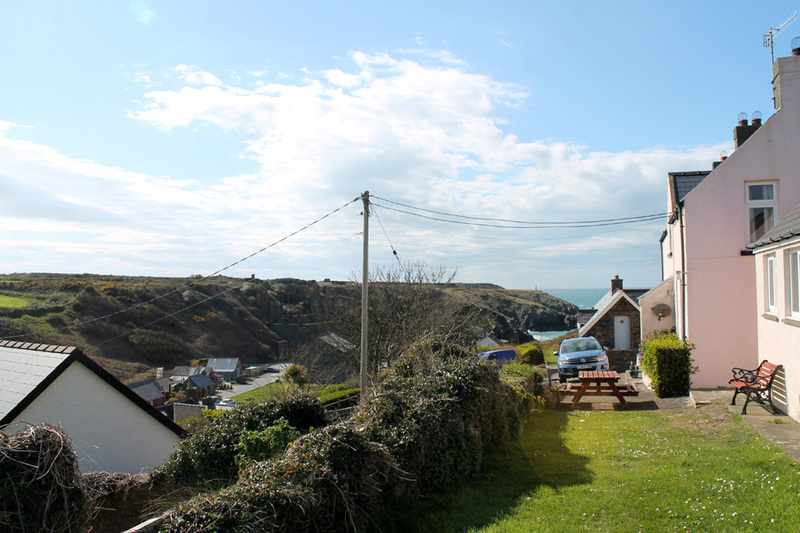 Stayed at : Doves Cottage, Abercastle, North Pembrokeshire. 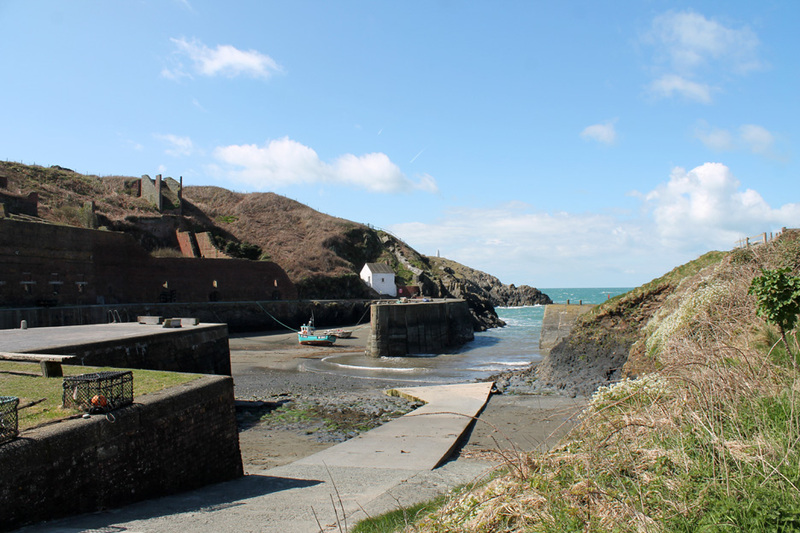 Places visited : Porthgain Harbour and cliff walks. Walk details : Local round walk of an hour or so. 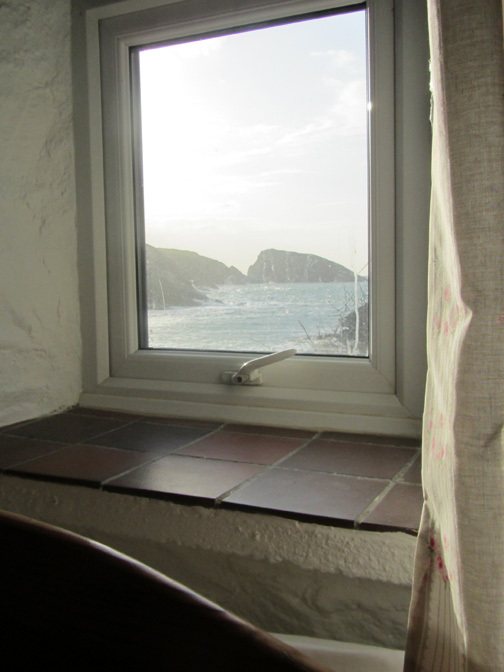 Highest point : Sea Views and a return to old haunts. 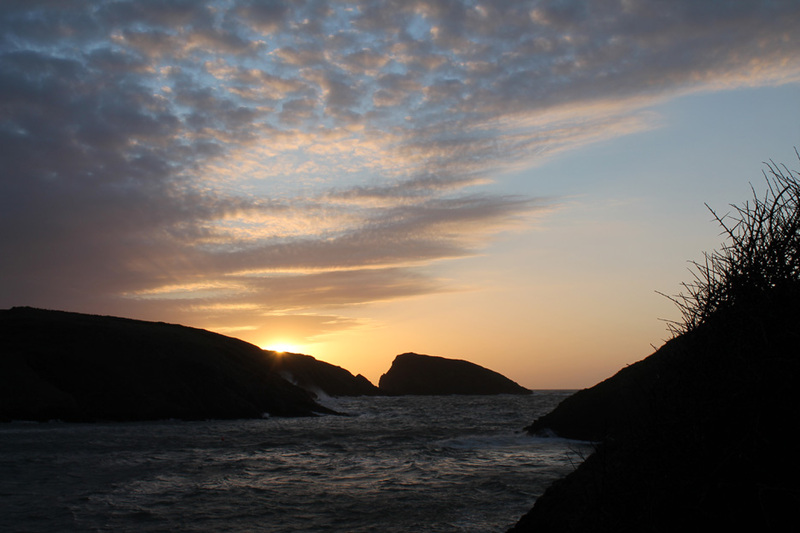 Weather : Sunshine, blue skies, fair weather clouds but a cool northerly breeze at times. 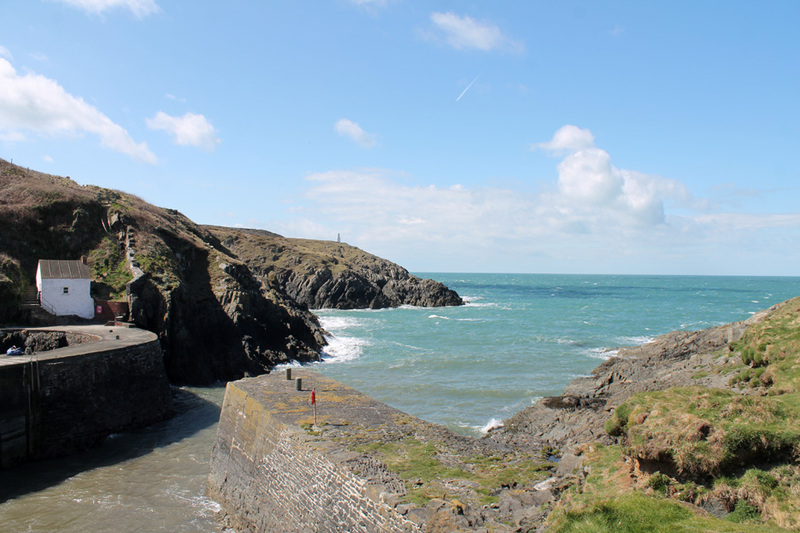 The second full day of our holiday found us at Porthgain on the West Wales coast. 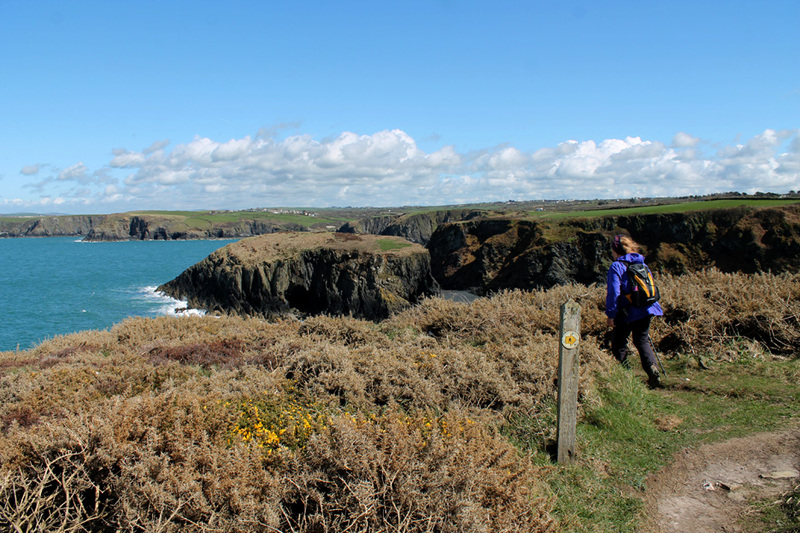 we brave the sunshine (and the cool breeze) for another walk along the Pembrokeshire Coast Path. 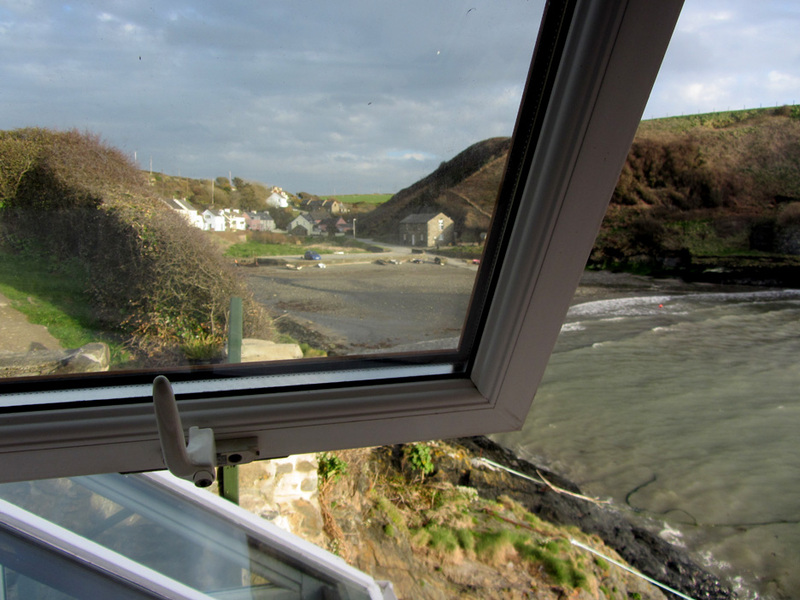 It is a fine morning as we check the weather from our bedroom window. Must have been up for a while . 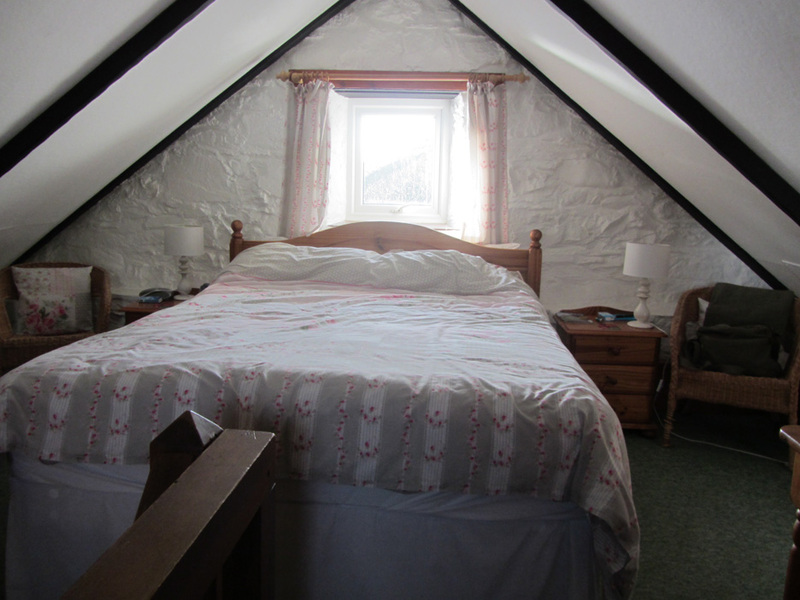 . . the bed's made ! Looking west to the outer harbour. They seem full of beans ! As it says in the tin . 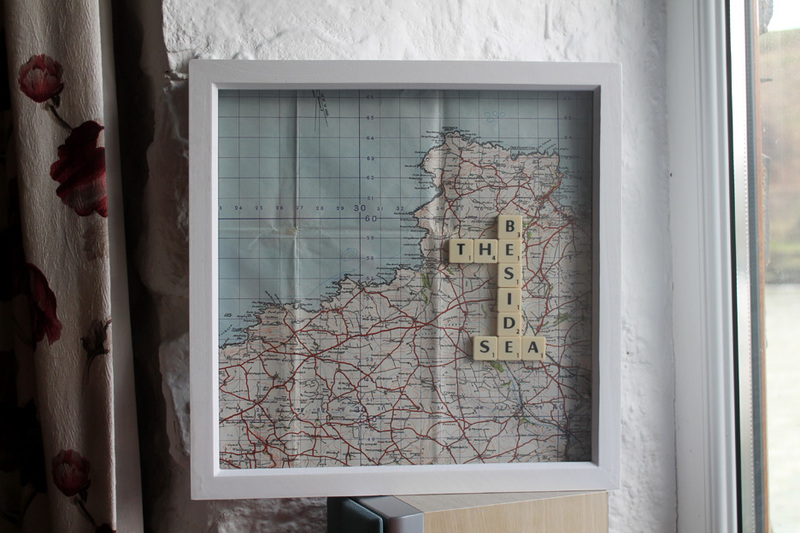 . .
Out to sea the sea state reflects the consequences of the strong northerly breeze. 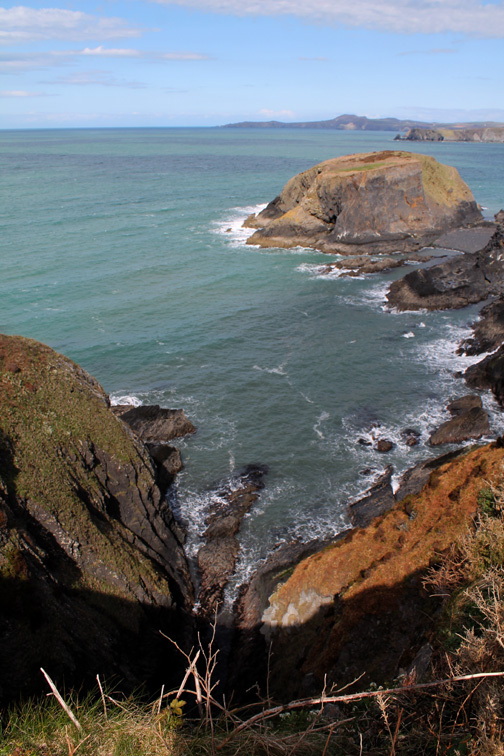 between the headland and the island. 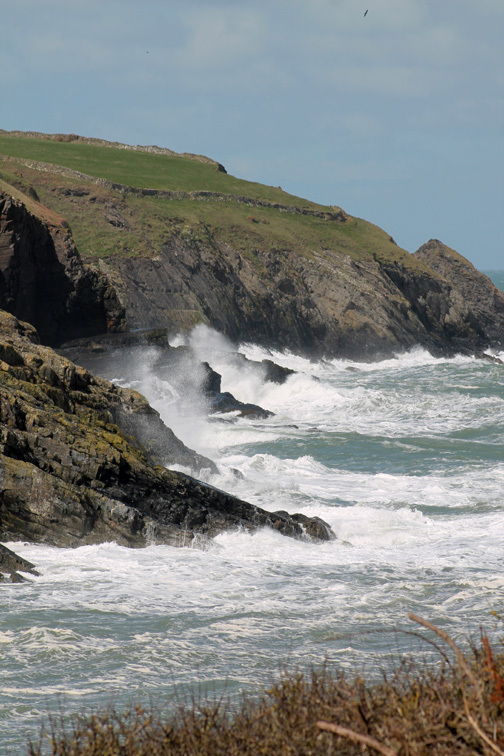 dances as each wave passes. 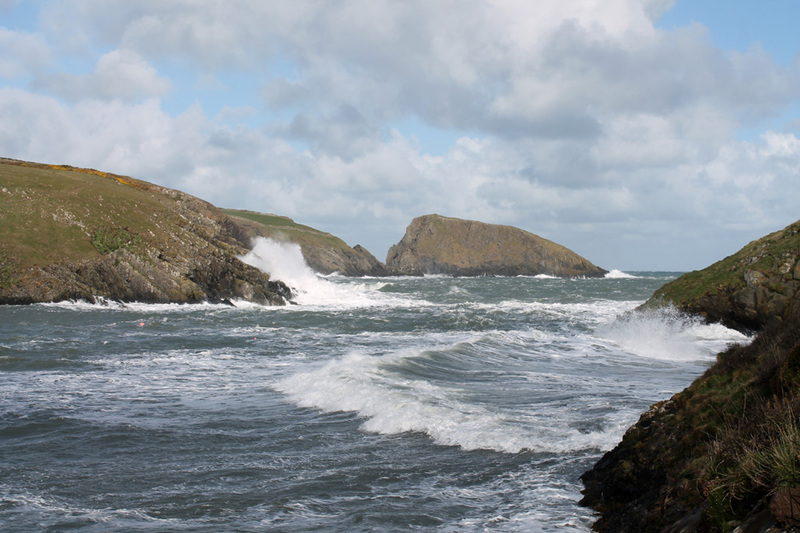 However we mustn't stay in the cottage all morning so the dogs and I take a quick stroll around to the other side to see the waves. 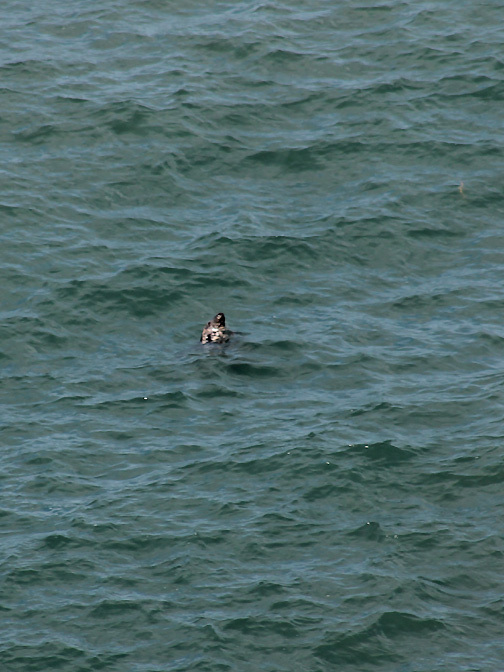 Further out, towards the headland, I recorded a brief video to the sea conditions . . .
Click the start button above to see the short Loweswatercam video from the cliff path. Late in the morning the wind drops and the sunshine increases as forecasted . 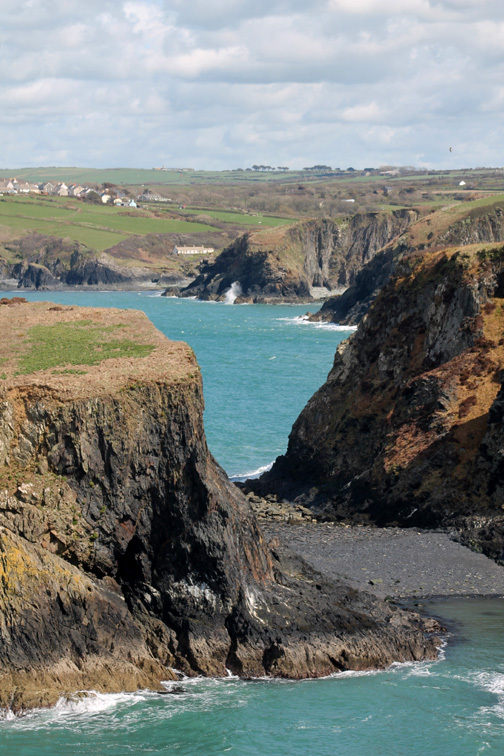 . . time to enjoy another stretch of the coast path. 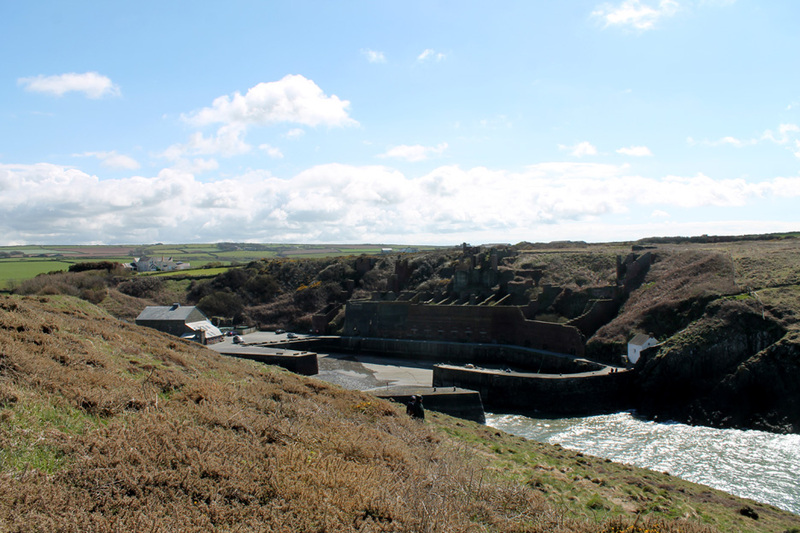 Looking back at the Fishermen's cottages at Aber Draw Bay. They have been renovated but still include the classic cement rendered roof that keeps the tiles on and the Pembrokeshire weather out. 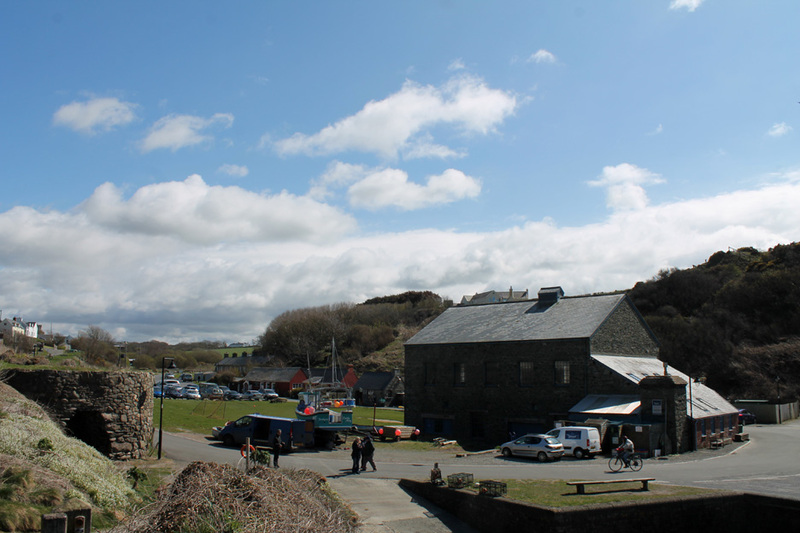 We park in the very convenient car park in the centre of Porthgain. 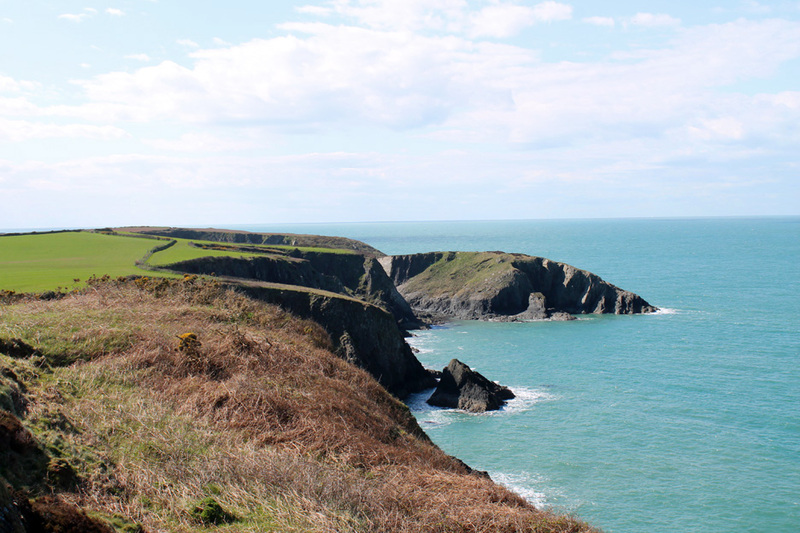 was the slate and road stone quarries high on the cliffs to our left. 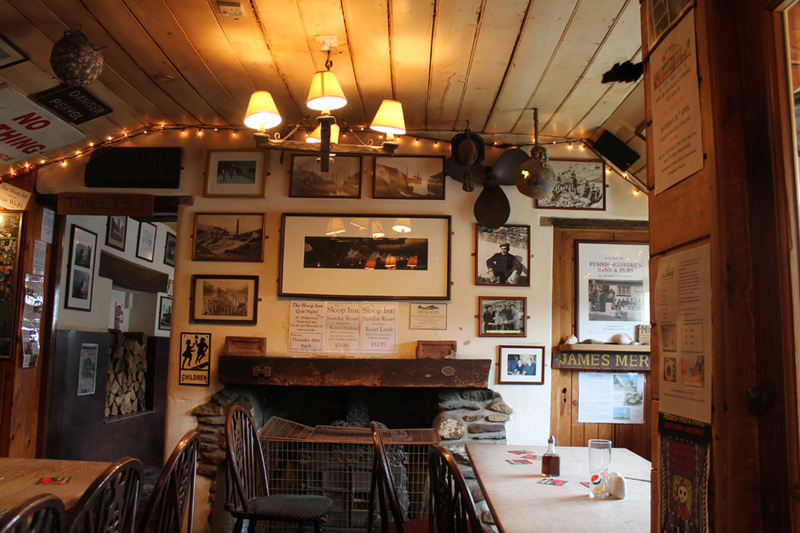 Today first stop is "The Shed" to book an evening meal for later in the week. but inside it is a different world. 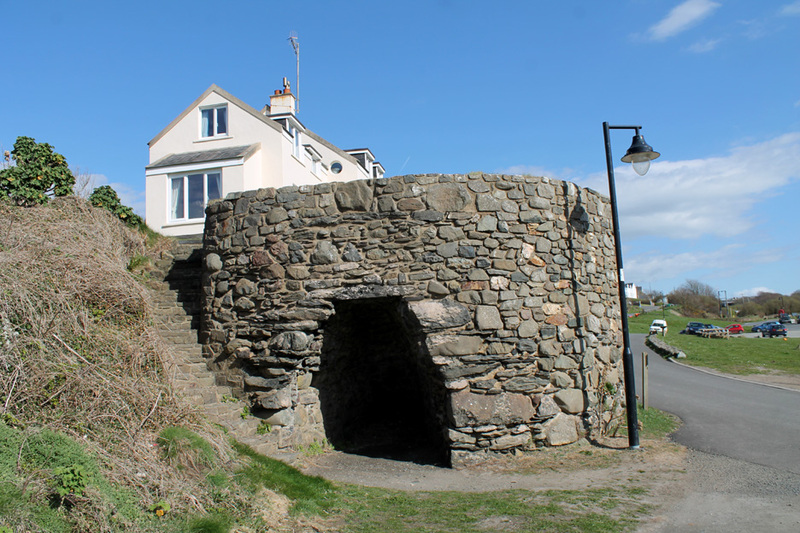 detailed and complex history of the village. Well worth a visit . . . the food and drink's not bad either ! 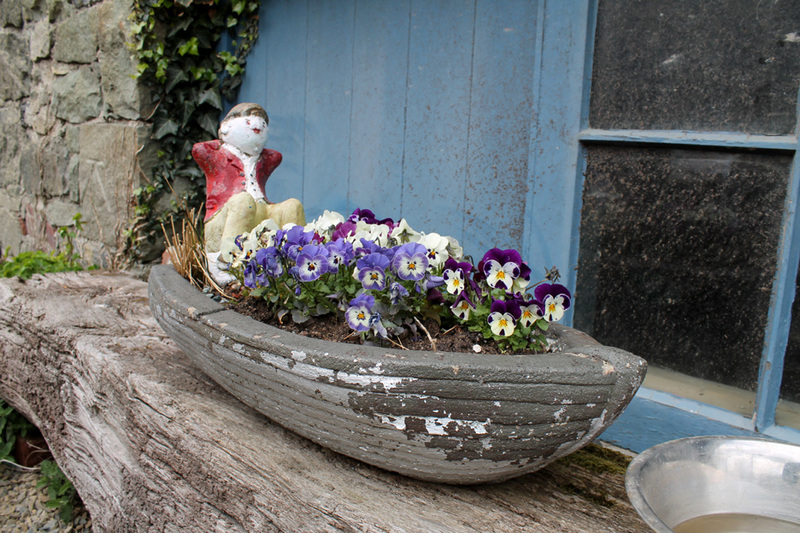 Leave yourself a little time to browse if you haven't been there before. 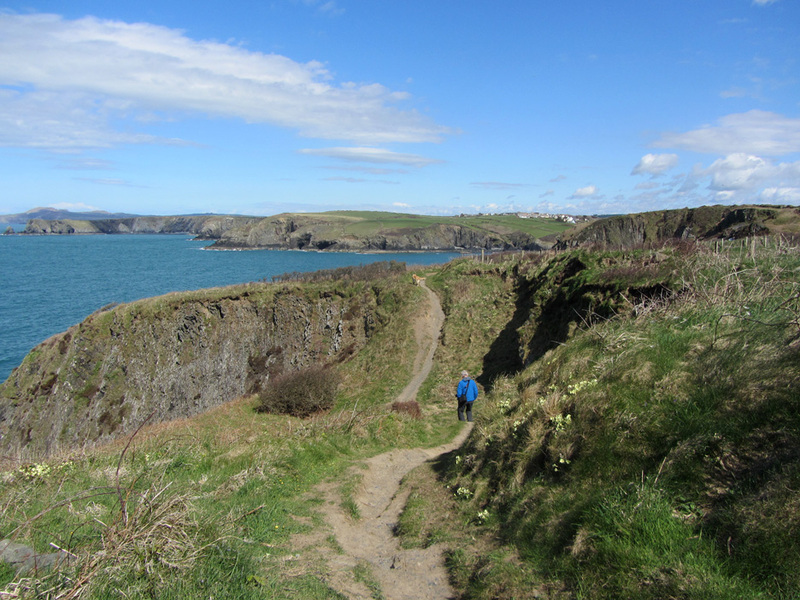 The walk starts as we join the coast path down at the harbour. 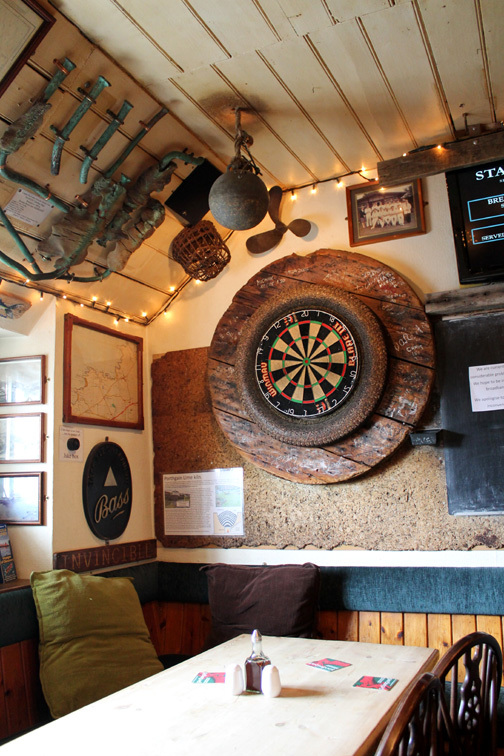 "The Shed" was originally a brick works but the front section is now a Seafood Bistro and wine Bar. 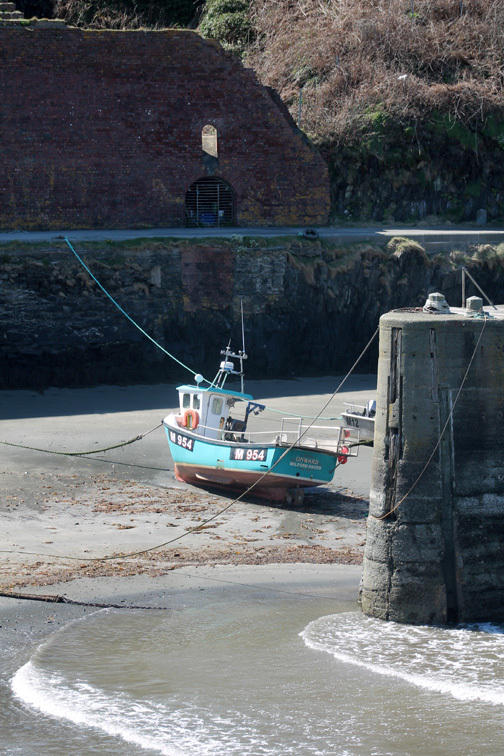 Local fishing boats in the substantial harbour . . .
. . . high walls keeping those north westerly waves at bay. 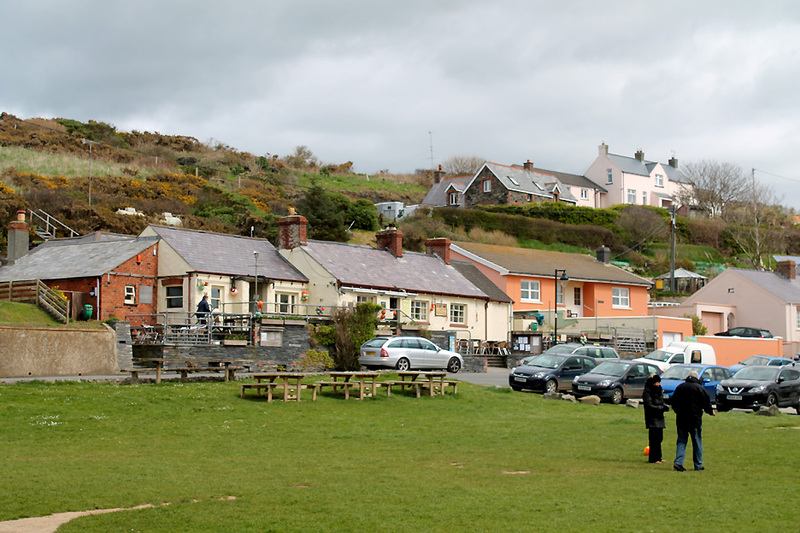 The white cottage opposite is the old Harbour Pilot's office. 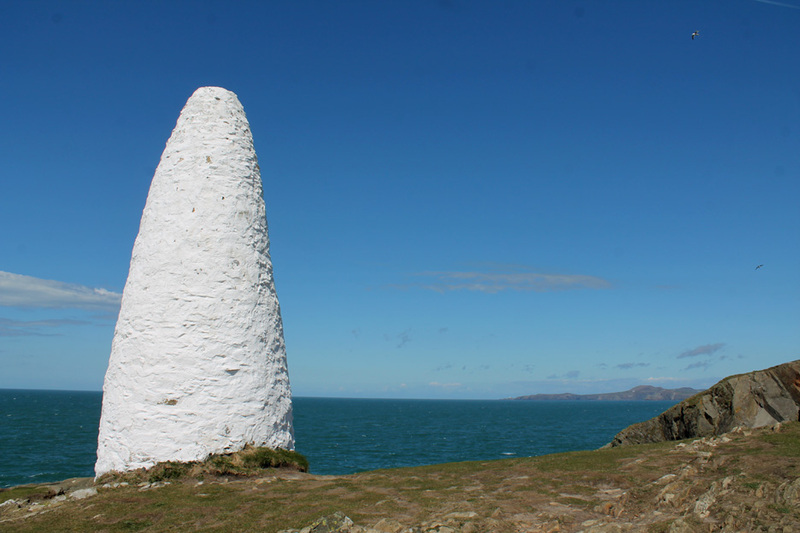 On the outer headland is the southern 'harbour mark' to guide ships into the safety of the inner harbour. when Ann and I walk that direction in a day or so's time. 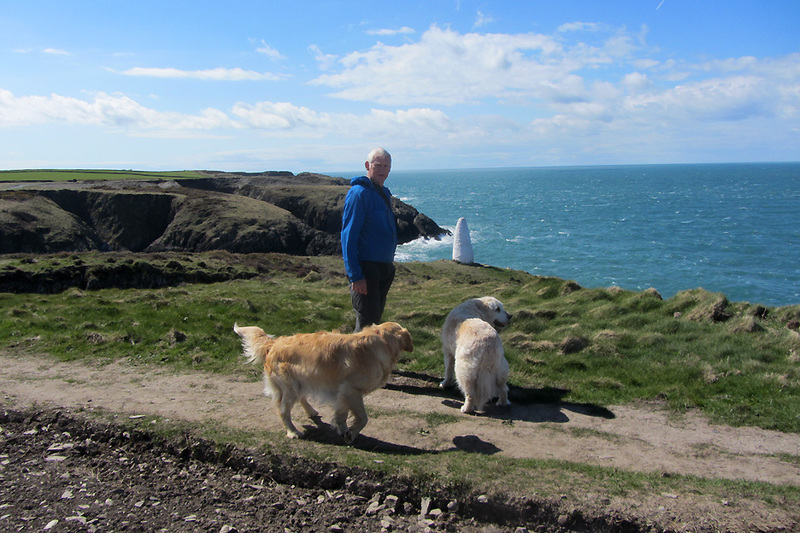 Today the coast path north took us close to the northern harbour mark. 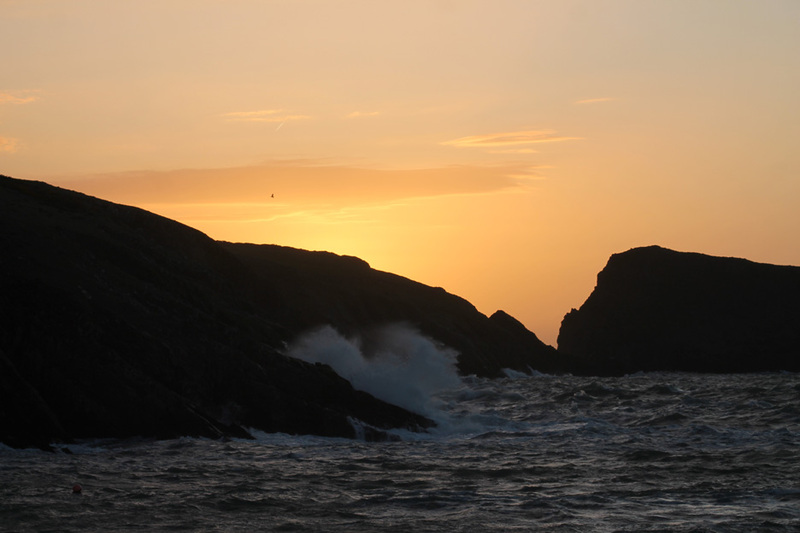 Together with the one opposite they offer a reassuring lead into the harbour from the open sea. Interestingly the other is square in profile, this one is rounded, so that you can tell where you are even if you only spot one. The cloud has cleared and the sun is out . . . but it is cool enough to need a light jacket. A stone cairn marks a turn in the path. Classic sea cliff views all the way up the coast . 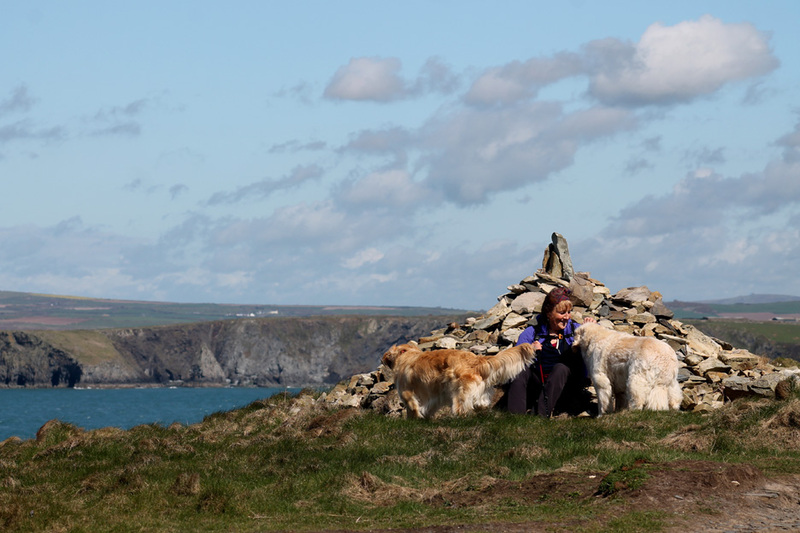 . . past Abercastle and on to Strumble Head. 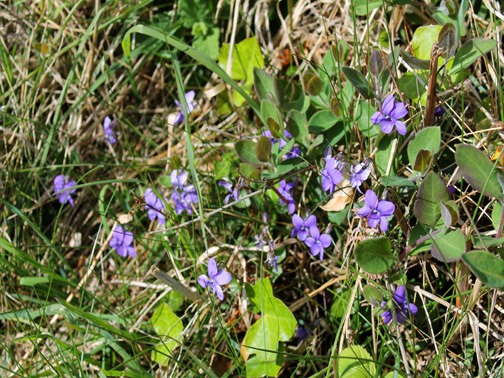 More colourful violets (Viola riviniana) on this section of the path. 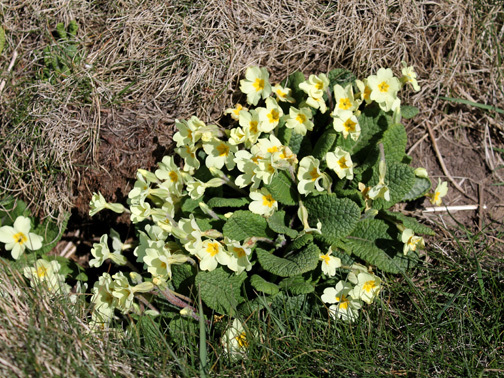 Primroses (Primula vulgaris) were in abundance too. At another corner Ann leaves the path to check out the view from closer to the edge. 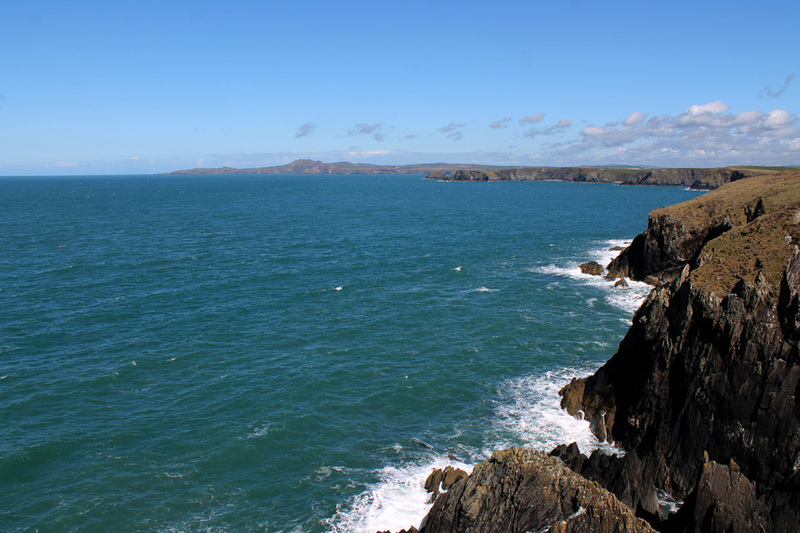 The island of Ynys Fach (small island) as viewed from Trwyn Elen headland. 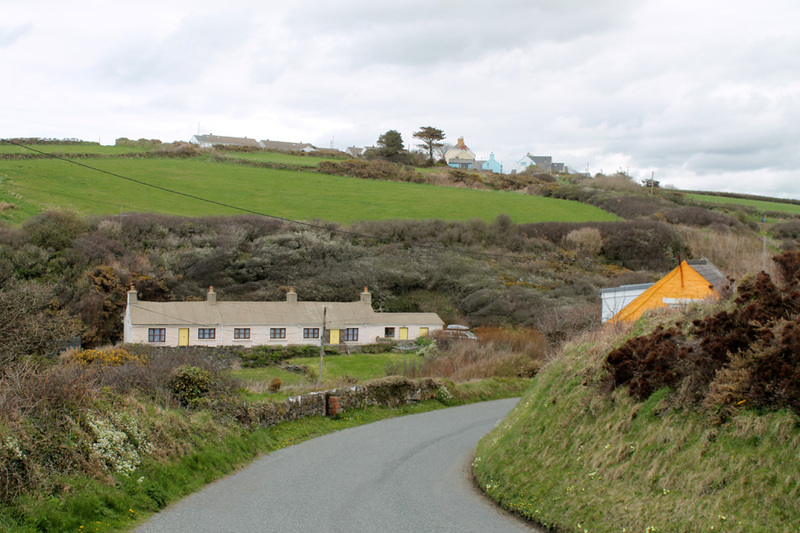 Through the gap to those cottages at Aber Draw again. 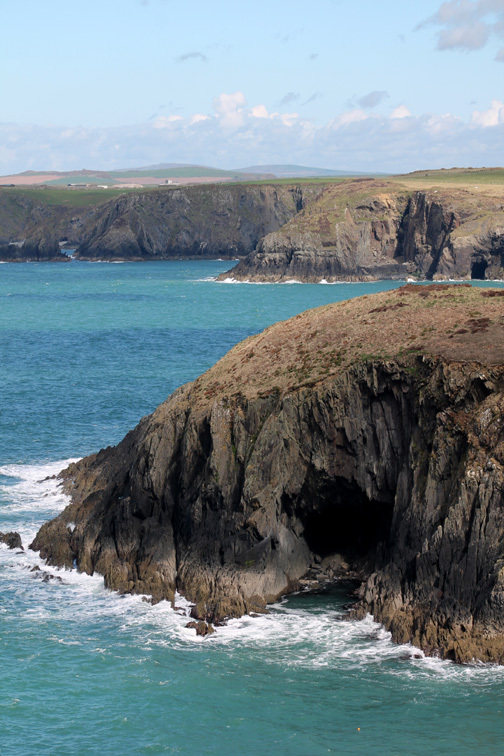 Sea caves on Ynys Fach. Onward on the undulating path. 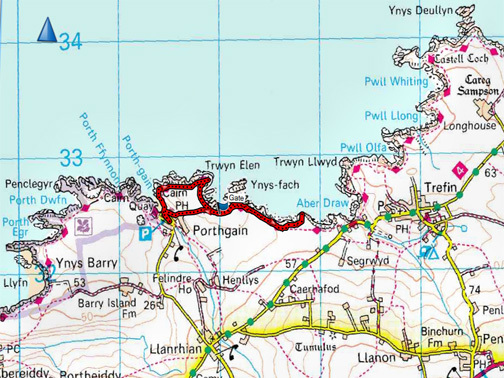 Around ever closer to Ynys Fach . . .
. . . where there were fine views of the rocky coastline. 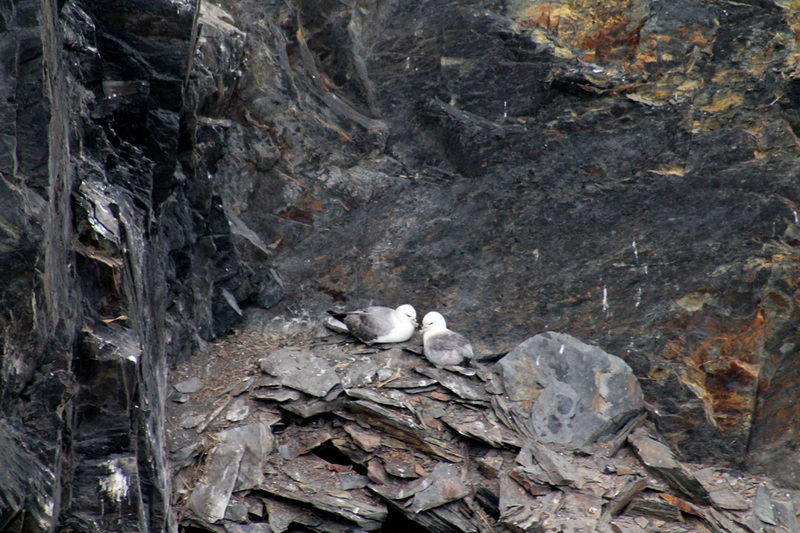 Two Fulmars sit together on a precarious ledge on the cliffs below. 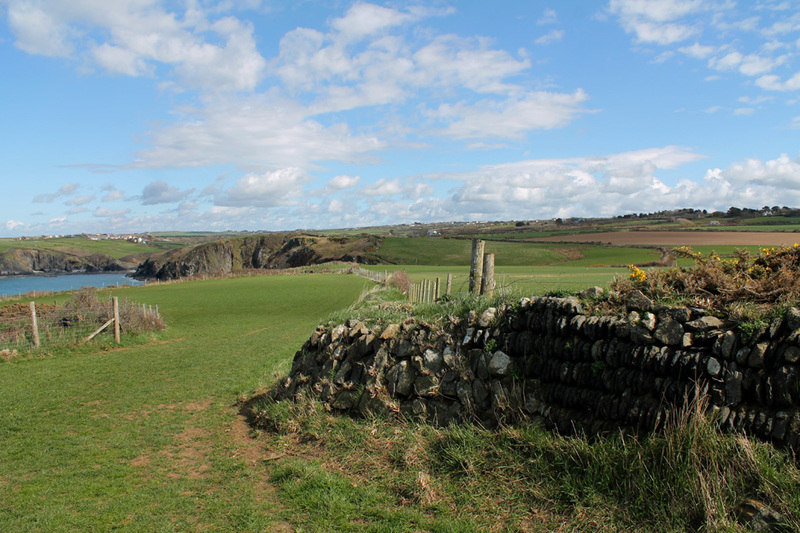 On across the fields, the path leaving the cliff edge for a short while. 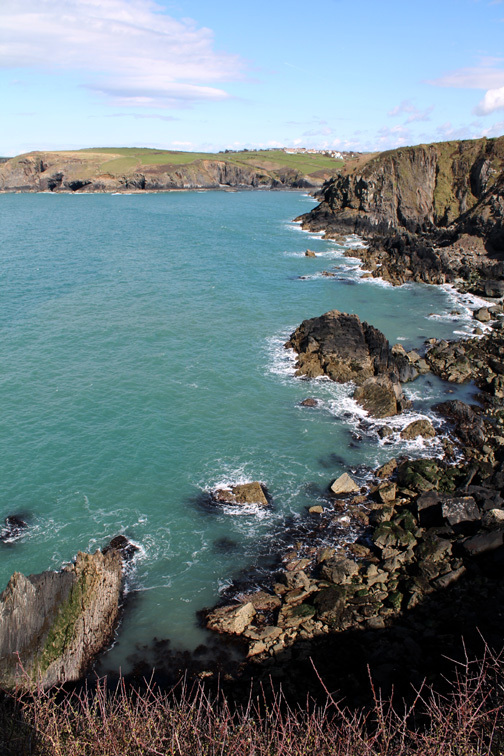 Another fine earth-filled Pembrokeshire stone wall to our right. Our turn around point . 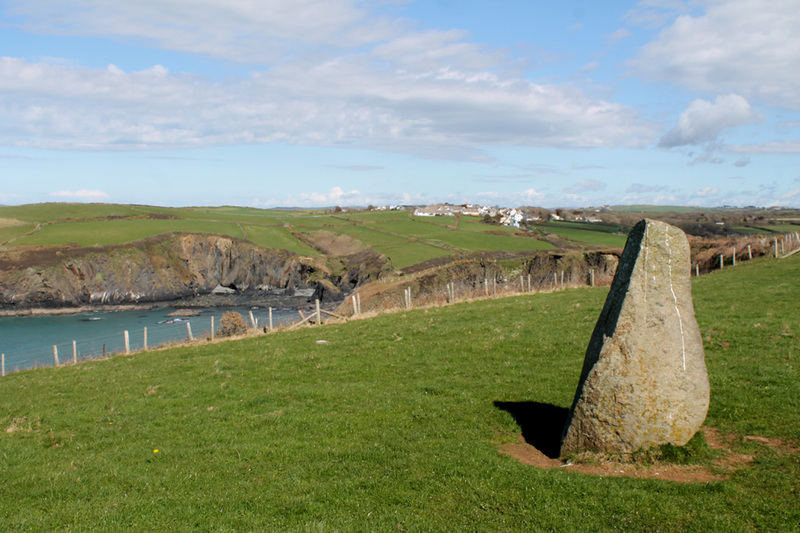 . . at the standing stone in the field that looks down on Aber Draw Bay. 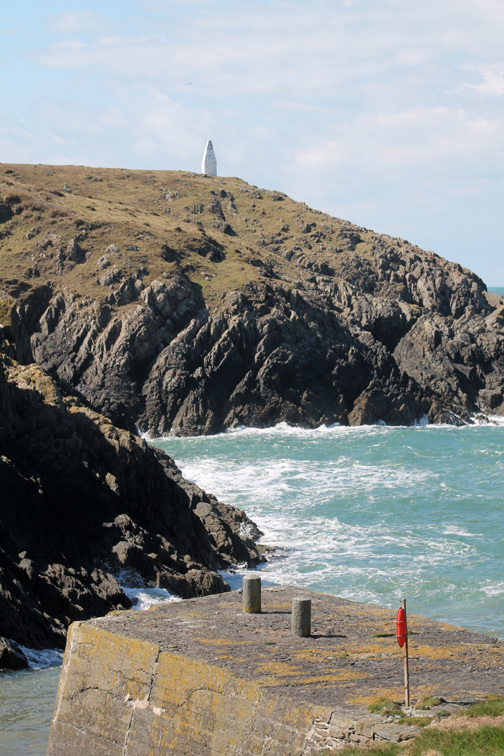 Time to face south and re-trace our steps back towards Porthgain. 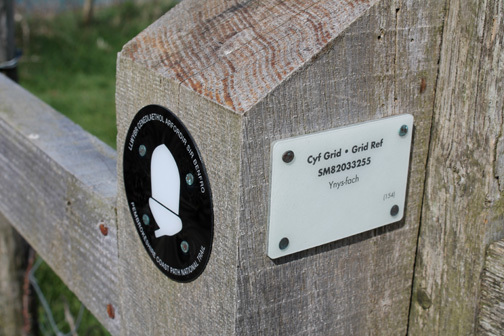 on the coast path by looking at the sign on the gate post. 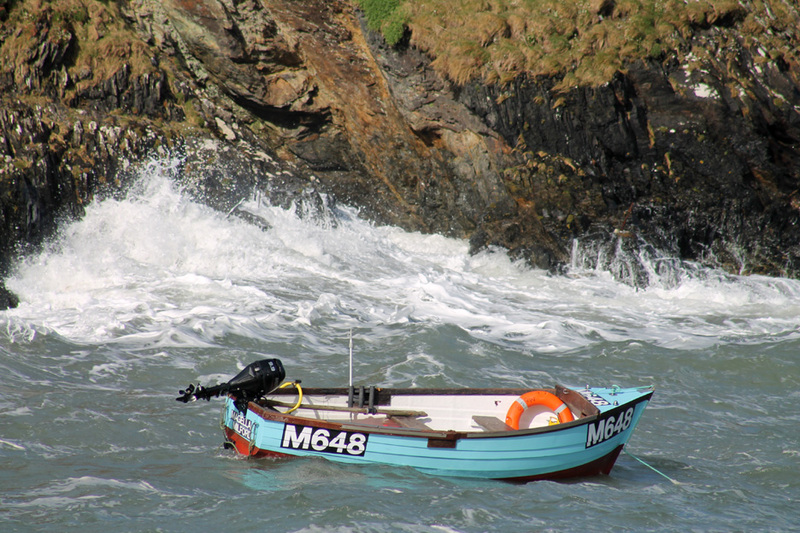 to friends or Coastguard Rescue. 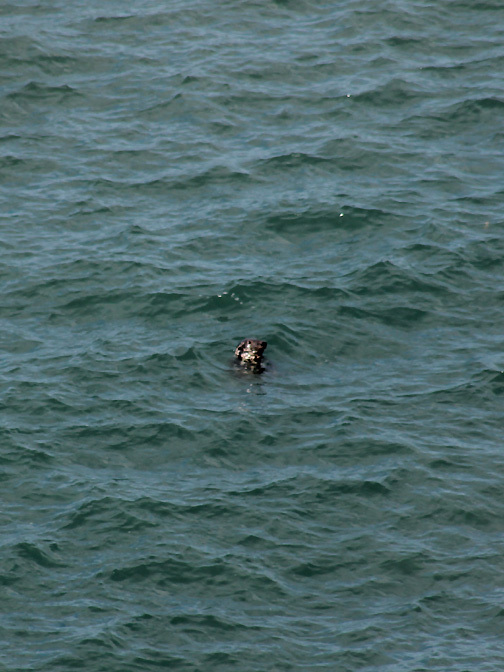 May is not the breeding season so these are more scarce . . .
. . . but we did see a seal relaxing, floating nose-up in the bay. 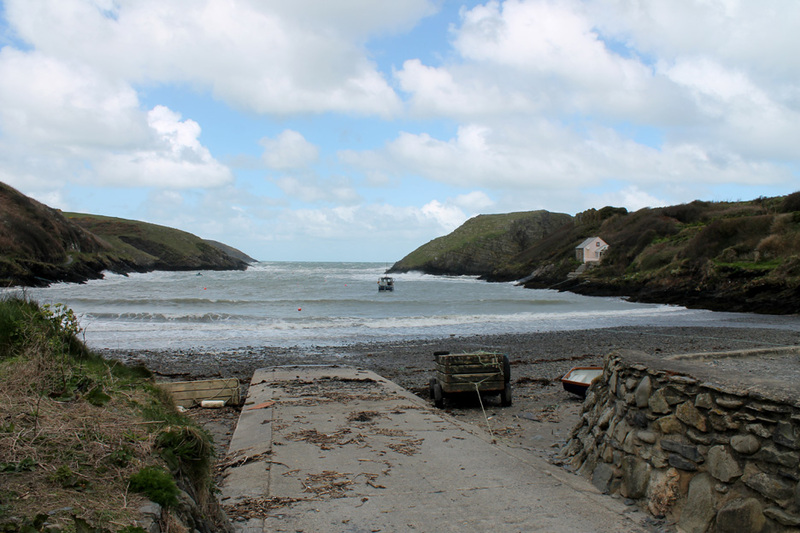 A short detour on a footpath takes us across the headland directly back to Porthgain Village. Too early to see what the farmer had planted but the first of the new growth is spreading across the field. Fortunately the path is well signposted as we need to cross the front gardens of several houses. 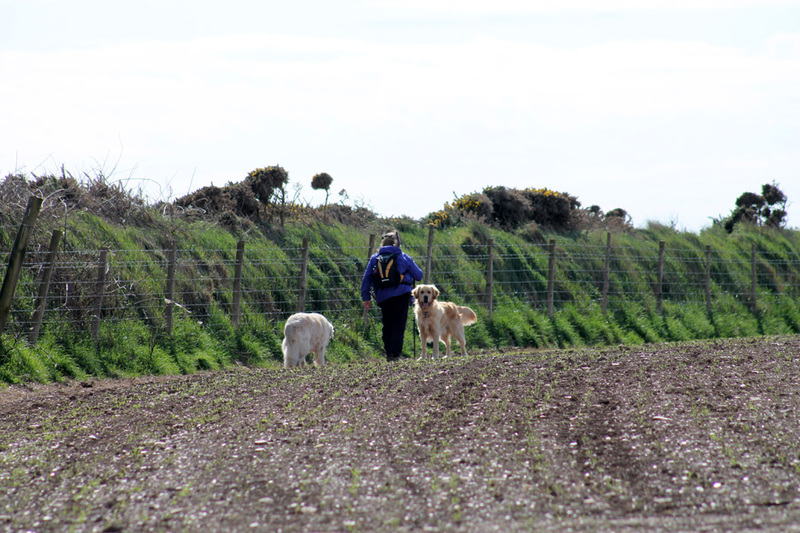 Down past Lime Kiln Cottage . . . and we are back where we started. 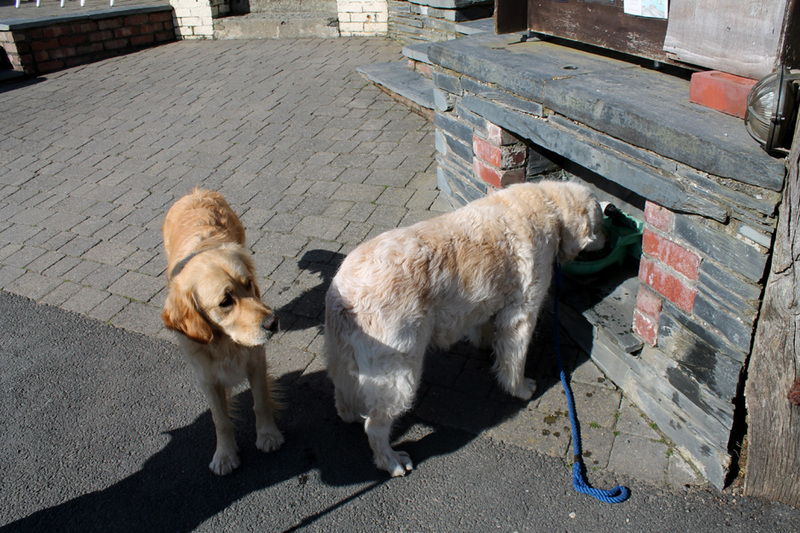 Time for another drink at the pub . . . for them but not for us . . . the teapot awaits at Abercastle. Hold your cursor over the picture to see if Harry offers Dylan a chance. 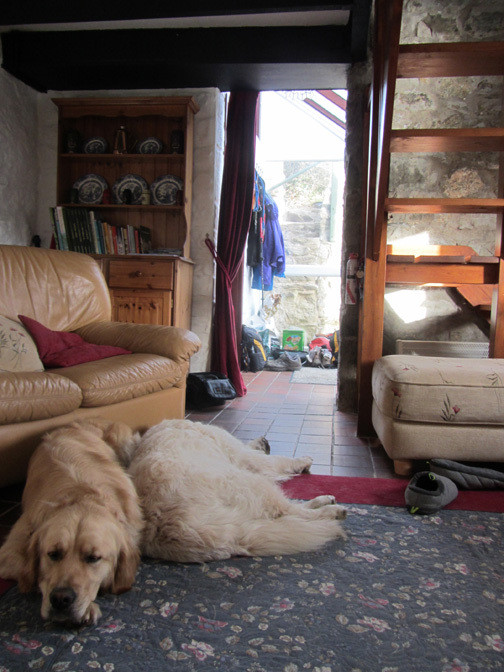 In the evening, where better to be than watching the sunset . . .
. . . than from our warm little 'Doves Cottage' at Abercastle. This site best viewed with . . . supper sitting in the window.